It’s great when we enjoy our curves and love and appreciate our bodies for all they do for us. I’m all about celebrating our femininity, feeling at home in our skin, and embracing change. But it depends what kind of change. My shorts were so tight today that the panic button on my car keys accidentally got pressed in my pocket when I bent forward -- so the whole neighborhood got a good dose of my car alarm before I could shut it off. Whoops! But, hey, our bodies are in constant flux as the years roll, nothing stays the same. Change is inevitable, but we CAN get to fitter place and lose extra fat and remember not to underestimate the power we have. Too much computer time has my metabolism starting to snooze. Time to start exercising more and clean up my diet again. I’m not stressing about it, life happens. Instead I’m rolling with it and experimenting to find what works now (not what worked 5 years ago). Getting off my duff and taking action! Like an artist molding a lump of clay, I’m going to have fun with the process and see what I can create. I’m looking forward to see how my body responds and to what activity feels best now. Whatever happens, happens. I still love my body, but if my new belly decides to flatten out a bit as I up my activity level, I’m OK with that, too. Here’s to us all rolling with the changes but taking action when we’re nudged, too. New free report about overcoming self-doubt will soon be available for everyone who joins the newsletter list. And since you’re on the list, of course, you'll get a free copy, too! Coming next week. The workshop on June 26 was fabulous! What a joy that I get to work with such loving, creative, and beautiful women! Thank you for your attending and for your attentiveness and passion. I know you will do well with your goals and effecting the changes in your life you seek. Next workshop is Thursday, August 26 in Petaluma (details yet to be announced, but I will say that it does involve CHOCOLATE tasting. Yep, you read that right!). I take a sip from my indulgently fruity drink. Yes, I’m alone tonight. But not really. It’s a busy restaurant, but the terrace area is only half filled so there’s a laid back relaxed feeling. The musicians gently fill the space (and my thoughts) with their tunes. Nature surrounds us. A white-tailed deer wanders up to the edge of the terrace to sniff a wayward paper lantern sitting on the rocks. A moment later her fawn, its youthful spots nearly faded, follows her and stares at me long enough to tempt me to let me take its picture. In my view, true romance does NOT require another person. It can easily exist between you and yourself, you and nature, or you and a higher power. Romance with another is just those special moments shared and appreciated together. My date with myself was a beautiful way to wind down on a Thursday night, and a loving gift to myself. For me romance is the mixture of aesthetic beauty, a natural feeling or element, and a certain sweetness of life. A poignant awareness of the fleeting magic of being alive. Romance is sweetness and specialness. Sometimes bittersweet, but always with the sweet. Bittersweet temporal moments of beauty and light pain that somehow equals a quiet joy. You are a beautiful part of this world. Romance yourself and draw more sweetness into your life. So many of us WAIT for romance to be delivered to us like a take-out meal. Romance never ends. It’s always there if you look for it all around you. Buy fresh flowers. Appreciate nature, really notice the details of the season. Feel more sensual, eat more slowly. Admire the beauty of the curve of your hip, the soft hint of jasmine in the air. Recognize the little things in life, those tender moments where we look upon the small beautiful scenes and grace around us. Whether you’re in a relationship or not, stop WAITING for someone else to supply the romance. No more existing with the“pause” button pressed on your life. Make romantic living a part of your self-care, appreciating the moments, treasuring our natural world, feeling sensual, and enjoying yourself. Treat yourself like the precious gem and unique gift you are to this world. Then drink it all in. That’s how a goddess lives. *Music was performed by a fabulous folk/pop due comprised of Megan Slankard and Jeff Campbell with a mix of beautiful original songs and classic quirky covers like Danny’s Song, Cinnamon Girl, Take It To the Limit, Easy (by the Commodores), even a surprisingly fun mellow version of You’re the One That I Want. Who likes a little crunch in their snack? When you're looking for a snack with the right crunchy texture, often the healthier choices are limited to carrots and celery. Good options, but when you're hankering for a chip and want to stay in the veggie family, try a homemade sweet potato chip! They're delicious and full of nutrients. In fact, according to the Center for Science in the Public Interest (CSPI), the sweet potato ranked the highest in nutrition among all vegetables! (See the report.) While I'm not sure about the study, I do know that these are delicious, satisfying, and a much healthier option than your usual processed out-of-a-bag chips. 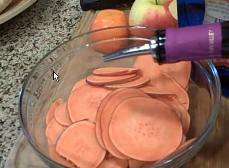 Check out the fabulous and beautiful Cecilia Kinzie's video of how to make Raw Sweet Potato Chips! Cecilia Kinzie is a raw food teacher in Sonoma County who gives people practical tools to easily add more raw food into their diets so that they feel better, experience more energy, look years younger, and radiate a happy healthy “raw” glow. For more easy raw food recipes please check out Cecilia's Raw Glow Blog. Enjoy a wonderful holiday and long weekend (for you U.S. folks) appreciating your family, nation, and, of course, the summer. Keep your dreams in the forefront of life and take action on them. With determination and focus, you can create anything you want in your life.